Sometime after March, the IMechE will be auditing the CPD records of its members who have opted in. This practice is in response to the Engineering Council’s CPD policy of professional institutes to support the developments of its members. The idea is that the auditing process will encourage members to take ownership of their development. Here I present five reason why I chose to opt-in. A little bit of blatant self-promotion here :)……but it is really nice to know that the Institution has noticed my work towards promoting CPD and has mentioned me in their news article. Thanks a lot. I hope everyone has used the Career Developer tool and updated their CPD for 2017 and in the process of setting up goals for 2018. I will bring out more infographics to cover this in the coming days. I’ll keep you all posted. Webinars are a great way to add to your CPD and you are a member of the IMechE then you have access to archived webinars. These can be accessed through the IMechE Learning Management System (LMS). The infographic will show you how to access the webinars and add hours worth of CPD to your profile. Wife: Okay, I’m about a 100 million years behind you. Nature……the greatest teacher ever when it comes to amazing feat of engineering! The day came to an end over a pint of DNA ale at the Eagle pub in Cambridge where the famous duo Francis Crick and James Watson announced the double helix structure of the DNA. Your CPD can be fun too! 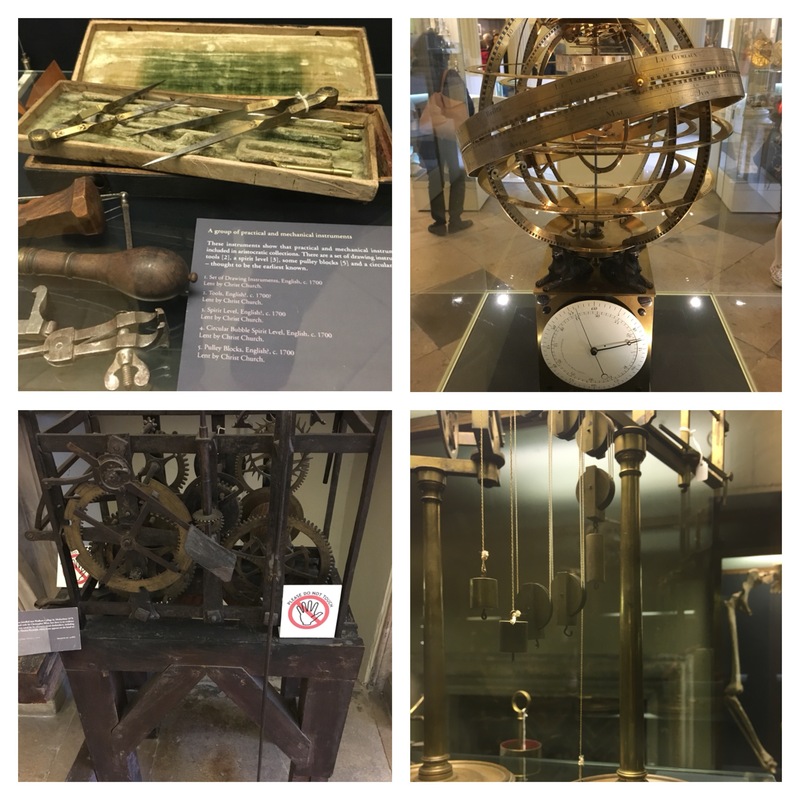 A vist to the Museum of the History of Science at Oxford. Me: This is a question I like to start out with; what motivated you to become a chartered engineer? Andrew: I want my students to know that I am a Mechanical Engineer first and an academic second. There are a lot of lecturers in my department that have a background in Natural Sciences and Maths who have moved laterally into Mechanical Engineering. I have a lot of respect for these guys, and they do make a valuable contribution to research and teaching. But they invariably lack the relevant industrial experience that the majority of students want to seek advice about. I want to make it clear that I have this experience from previous industry posts. Being a Chartered Engineer and member of the IMechE prompts a lot of questions from the students. They want to know more about my background, and what they need to do to become professionally registered themselves. Me: I am glad to know students are enthused about professional registration. You pursued registration through the IMechE, so were you able to find all the information on the IMechE website or did you also look at other sources? Andrew: The IMechE website was great. They had an exemplar application from laying out how each professional competency can be evidenced. It is worth being mindful that the IMechE professional competencies are derived from the Engineering Council’s UK-SPEC. I would advise potential applicants seeking registration through any institution to read through this document before preparing their application. Me: Excellent! Now, when it came to filing up the application form, may I know how long it took for you from making a start up until final submission? Any tips on filling out the application form? Andrew: I wrote most of my application form in one day! Admittedly I then sat on this for two years as I felt that my evidence for technical and commercial leadership was fairly weak and I wanted more time to gain experience. Once I finally decided that it was the time to submit it probably took another few hours to update the application form. My advice would be not to procrastinate and to get as much of your experience written down as possible, even if you are not quite ready to submit. Me: That is excellent advice Andrew, as many people get bogged down by the process. Making an early start in assessing your skills and experience is indeed important. So next comes the professional review interview and everyone seems to work up a sweat thinking about it, so how did the professional review interview go? What was your view of the interview process? Any advice for people who are preparing for their interview? Andrew: I had two Chartered Engineers on my panel who were very professional and friendly. All of the questions pertained to the evidence that I provided in support of the professional competencies in the application form. I got the impression that they were satisfied with the application from and they just wanted to confirm my experience, knowledge and understanding. I would advise anyone invited to interview to bring their laptop with them with prepared examples of project work to use an aide-memoires. Stick to images and drawings whilst avoiding lengthy reports or demonstrations of computational software that might crash. I was not asked to present a PowerPoint slideshow! Me: How long did it take before you received the outcome of the interview? Me: Has the title ‘Chartered Engineer’ made a difference to your career or personal life? Andrew: It would be worth asking me this question in five years’ time, as I have only been a Chartered Engineer for a few months now. One decision that I have subsequently made was to join my local IMechE panel, which I never would have thought to do if not Chartered. Me: I am glad to know that you are making a contribution to the local IMechE panel. Lastly, what is your advice for potential registrants? Andrew: Don’t sell yourself short. If you are toying with the idea of registering with your chosen institution and becoming a Chartered Engineer then you should definitely get the ball rolling. Write a draft of your application form and address any gaps in your experience. Reach out to Chartered Engineers in your institution’s regional panel for advice, these guys could potentially sponsor your application once they get to know you. Me: Thanks a lot for your helpful insights and advice Andrew. I am sure the members of the Professional Registration Support group and anyone seeking to get professional registered will find this helpful. Andrew: You are welcome and I am glad I was of help. His research and teaching profile is available on the Newcastle University website. • Language: Competency D1 looks at how well you can communicate in English with others at all levels, so it’s vital that you demonstrate that, starting with the application form. It is important to get the basics right- spelling and grammar, as there can be no greater put-off than a misspelled word or using the wrong verb tense! English may not be your native language (as with me) but make that extra effort to get it right. Use the spell-checker, ask your colleagues and friends to proofread or get help from a professional proofreading service. • Acronyms: It is easy to forget that certain acronyms can be specific to an engineering discipline, workplace and geographic location. So make sure that you include the actual word or phrase and then carry on using the acronym for the rest of the application. • Examples: Provide examples, specific ones, which can relate to each of the competencies. Examples are a great way of telling a story (where you are the protagonist). Giving examples rather than a generic statement helps the reader understand your contribution. And once again- avoid generic statements. For example – ‘I improved the efficiency of the jet engine and increased its life span’ Vs ‘I improved the efficiency of the jet engine by reducing the weight by 2% which added an additional 10,000 hours to its lifespan’, which one sounds better? • Concise: Here is the difficult part, you got to tell a story but keep it concise. I would suggest you put everything down in your first draft and then start slimming them down in the subsequent ones. I would be very much interested in receiving your thoughts, comments or suggestions. Here at GE Oil & Gas, the company that I work at, offered a Company Based Registration programme, so when it came to the professional review interview, it took place in the company’s premises, hence I didn’t have the need to take time out from work but neither could I get much work done on the day of my interview! As I was waiting in another room, the interview facilitator walked in, sat down and started briefing me of the interview process. Apart from ensuring the interview proceeds smoothly and fairly, I personally believe the facilitator’s job also includes calming one’s nerves! I was explained of the role of the two assessors, what were they expecting during the interview and what happens after. I was ushered into the room; a brief introduction took place and the interview commenced and this is where I can stop using the word ‘interview’ because all I remember was a lively and healthy discussion of my roles and responsibilities. I abused the word ‘I’ and used it in every other sentence and you should, because the interview is about you, and the assessors are here to judge your level of responsibility and commitment to the profession. I had taken along with me, few printouts of test rig drawings that I helped design, examples of technical reports (ensure all documents adhere to your organization’s IP policy), evidence of CPD in the form of certificates of the courses that I had attended and I also took examples of relevant writings from my blog. These documents were there just to support what I had already put in my application form. There were no trick questions posed nor at any given time did I feel that I was being cornered into a tight spot. The interview turned to be as lively and professional as it could be, and in the end the assessors had to stop due to us going over time. I left the interview thinking that we did not cover all competencies and I was already making up my mind for an appeals process! Gladly I didn’t have the need for it. The interview took place in early November 2015 and towards the end of the month I received the congratulatory e-mail from IMechE. So the interview, as I take it, was there to understand why I wanted that CEng. The whole exercise also provided an opportunity for me to step back and assess my skills and experience. This could arguably be one of the most daunting task on your way to becoming professionally registered. You have spent years collecting all the evidence and now you need to put them into words and you suddenly hit writer’s block on every other sentence! Not to worry, it doesn’t come easy to everyone, as a matter of fact it took me a couple of months to produce a succinctly completed application form. Here I have gathered a few writing tips from my own experience and from around the internet. Feel free to add your own. 1. Create a rough draft of the application where you assign a particular task, skill or experience to a specific competency. Do not worry if one of them fits into more than one competencies. Use this draft as your stepping stone. Once you have filled in all the competencies, you can then start to refine, that is, remove the misfits and elaborate on the ones that fit. 2. Use first-person language: it is ‘I’ all the way. The whole process is about getting to know YOU, so now is the time to subtly boast about your roles and responsibilities – I undertook this project.., I scheduled the.., I liaised..
3. Your application form is prime real estate, make sure every word counts in communicating your message. 4. Proof-read like your very life depends on it…..well, that is a bit too exaggerated but you get my point! 5. Get other people’s opinion, get your colleague or friend to give it a read. Does your writing communicate clearly to a diverse set of people? This is just a short list and I am sure everyone have their own style. What about the tone- formal or friendly? Feel free to share and discuss. Me: Hello Larry, thank you for agreeing for this interview. So to start off with, let’s begin with what motivated you to become a chartered engineer? Larry: You are welcome Bala. That’s a good question; After completing my PhD, I worked for Newcastle College as an engineering lecturer. In January 2014, I was promoted to the role of deputy section manager of the Energy Academy in Newcastle College. Part of my role was to meet with senior managers of external companies with the aim of improving our teaching quality and course development. After one such meeting, one of the principle engineer of the company enquired whether I was a chartered engineer, and my answer was “no” at that time. He said, “Even though you got your PhD, I still do not trust your decisions as you do not have enough commercial experience…” That comment set me off on a path to become professionally registered. After reading through information regarding chartered engineers and consulting with other CEngs, I realized that, “CEng for me personally, meant that I now have the external recognition of my competence. In the workplace, it demonstrates a level of professional credibility when dealing with external companies or bodies”. Looking at my experience back then, I recognised that to become a chartered engineer I needed to demonstrate commercial experience within an industry. I therefore moved to an opportunity where I could nurture this and it lead to me getting a job as the lead RF engineer at Eaton in June 2014. Me: Which institute are you a member of? Did they provide you enough information to pursue your goal for professional registration? Larry: I am a member of the Institution of Engineering and Technology (IET). Yes, I was provided sufficient information through their website. I also went through the Engineering Council website which has a wealth of information. Me: How long did the application process take? Larry: I submitted my CEng application in May 2016, and got my final assessment by a panel of experienced registered members by the end of November. CEng certification was received in January 2017. The IET website provided a thorough breakdown of the process. Me: I get asked this question a lot and now I ask of you the same- how did the professional review interview go? Larry: My Professional Review interview with the IET took place at IET London, Savoy Place on November 2016. Two chartered engineers probed all competences, and they placed special stress on competence ‘C’. I just had to expand more on the written evidence. The interview went well and lasted between 2~3 hours. Larry: In the middle of December 2016 I received the final decision that my application had been successful and that I was now a chartered engineer. This news was the 2nd best gift for my Christmas! The first one was passing my PhD viva in December 2012. Me: Has the title ‘Chartered Engineer’ made a difference to your career? Larry: CEng is just a certification, which cannot change your life overnight. But I got a huge amount of invaluable experience in the process of filling out my chartered engineer application form. It helped me assess my skills gap. For example, one of the CEng competence was to provide technical and commercial leadership. Therefore, I took on the additional role of a project manager to meet the requirements. This helped me understand project management thoroughly. I therefore believe that the mere act of getting to a CEng status has made a difference to my career and now that I am one, there is more to come. Me: That is great to know Larry and lastly what is your advice for potential registrants? Larry: I started my CEng application in the year 2014, and received my CEng certification in 2017 and that does not include the period that I spent on my PhD research. I would like to therefore advise all potential registrants to start building their CPD and portfolio as soon as possible. Me: That is excellent advise Larry. Thank you very much. I am sure the members will thoroughly enjoy reading your experience and may have questions of their own. Congratulations again on becoming a Chartered Engineer. Larry: Thanks Bala. I am open to member’s question and will be glad to help.